The study is part of a joint effort between the Consumer Wellness Center and Natural News (www.NaturalNews.com) to openly publish heavy metals test results for popular foods, groceries, herbs and dietary supplements. "These findings indicate that popular cereals tested demonstrate remarkably low levels of toxic heavy metals in their composition," explained lead scientist Mike Adams. "The concentration of metals detected in these cereals was consistently lower than what we are finding in herbs, superfoods or even many types of fresh produce." Adams is quick to caution that an absence of heavy metals does not necessarily mean these cereals are more nutritive or that they contain no other contaminants. 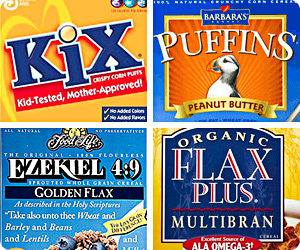 Conventionally-produced cereals may contain traces of pesticides and herbicides. 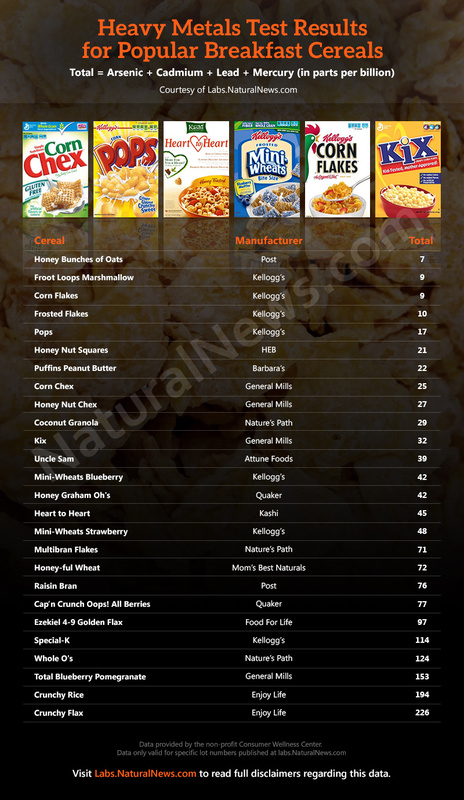 Some cereals are made from genetically modified organisms, and the cereals with the lowest heavy metals composition tend to be the most highly-processed or refined cereals which tend to lack nutritive minerals such as zinc and selenium. "The more refined a cereal's raw ingredients, the lower the levels of heavy metals we found," explained Adams, who still recommends consuming more holistic, minimally-processed cereals based on organic ingredients (even though they may contain slightly higher levels of heavy metals). At high enough concentrations, heavy metals are toxic to many organs in the body, including the kidneys and brain. Lead is linked to lowered IQs in children, cadmium is linked to kidney damage, and arsenic is known to increase the risk of cancer.